Winton has been a bogey circuit for the Red Bull Holden Racing Team, but a SVG/J-Dub quinella on Sunday got the monkey off Triple Eight’s back. Before this weekend, any mention of the word ‘Winton’ to anyone at Triple Eight Race Engineering would have been likely to instantly leave a noisy room so quiet you could hear a pin drop. The Victorian country circuit has – let’s face it – been a graveyard for T8 in recent years, with Shane van Gisbergen, Jamie Whincup and Craig Lowndes turning up for the fifth round of the season last week knowing full well that no car from the Triple Eight stable had won a race there since 2012. But after van Gisbergen led Whincup home in a Red Bull Holden Racing Team 1-2 finish on Sunday, we can officially say hoo-roo to the hoodoo. For most of Sunday’s 67-lap journey, it looked like Whincup, not his reigning series champion teammate, would be standing on the top step of the podium for the first time this year. J-Dub aced the start, beating pole-man Scott McLaughlin into the first corner, and seemingly had the race under control until a late-race safety car to retrieve Michael Caruso’s stricken Nissan compacted the field and set up a sprint to the finish. Whincup then ran wide at Turn 12 to give his teammate a chance to pounce, and Van Gisbergen and Team Penske’s Fabian Coulthard bullied their way past car 88 into first and second. The drama wasn’t done there either, Whincup immediately muscling back past Coulthard into second at Turn 3 and setting his sights on his teammate. But Van Gisbergen held firm, winning his fourth race of the year by just over a second. 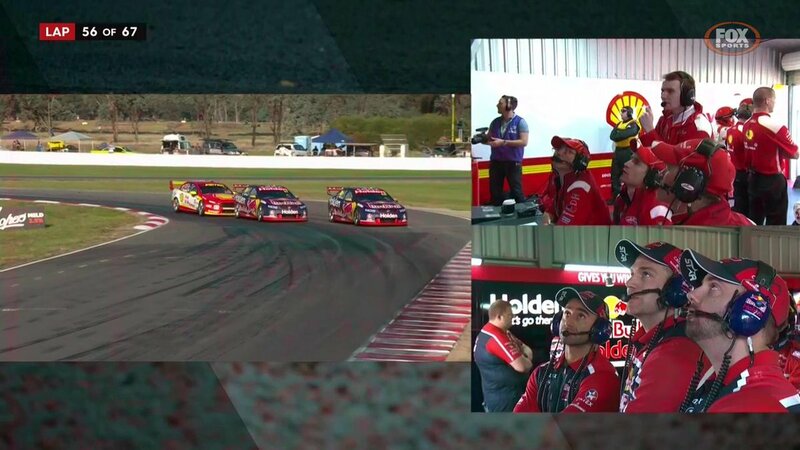 A 1-2 result was quite the turnaround for Triple Eight, which had managed a solitary podium finish at Winton since the introduction of the Car of the Future, and hadn’t won a race properly this season since SVG saluted inAdelaide for the Clipsal 500 (yes, we know he ‘won’ at Symmons Plains as well, but that was the race that finished behind the safety car after the massive shunt that took out half the field). While SVG was pleased to spray the champagne again (curiously, all four of his podium finishes this year have been wins), J-Dub was filthy on himself for letting a chance slip. “I feel like we have been working so hard, and today it has paid off,” a beaming van Gisbergen said after he retained fourth in the title chase, 37 points behind Coulthard. “Today was flawless, we had been lacking a little, but we pushed forward hard and the results show it. I haven’t felt that aggressive for a while, the car felt great, it was awesome racing. It got pretty full-on at the end there. On the other side of the garage, Whincup’s disappointment with his blue was compounded by the fact he could have departed Winton as the championship leader; as it was, he headed home just four points behind Coulthard in second place, but clearly wanting more. “I haven’t won a race this year and it is starting to get on my nerves,” he admitted. Sunday’s dramatic conclusion almost made Saturday an afterthought, when McLaughlin took his third win of the season, and from pole position to boot. J-Dub was second, beating Coulthard to the runner-up spot as he was to do again 24 hours later, while SVG had a more difficult Saturday, starting third but dropping to eighth after a start he described as “terrible” and a problematic pit stop that left him in the snarling pack as it snaked around a circuit where passing is at a premium. The third car in the Triple Eight trio, TeamVortex’s Lowndes, gained more places in the two races than any other driver across the weekend; the problem for ‘Lowndesy’ was that unlocking the one-lap pace from his Commodore remained elusive, as he qualified 19th on Saturday and 26th on Sunday. The veteran, who re-signed with Triple Eight for another two years in the lead-in to Winton, managed to surge to sixth on Saturday after a mammoth first stint before his opening pit stop, and he finished 15th on Sunday, a handy 11 places ahead of where he started. But it wasn’t where he wanted to be, Lowndes staying eighth in the championship, but now 334 points behind Coulthard’s series-leading tally of 1060. What’s next? The Supercars circus journeys from the chilly climes of Winton to shorts and sun and everything else Darwin has to offer in “winter”, with races 11 and 12 of the season set for Hidden Valley on June 16-18. Whincup finished third twice in Perth, finished second twice at Winton … anyone else noticing a pattern there that sounds like a good omen ahead of the visit to the Top End?